In 1889, just seven years after the Village of Mora was formed, and after several years of meeting in a local hall, a small, determined group formally organized and eager volunteers began construction of what would be the very first church in Mora. The Methodist Episcopal Church, on the southwest corner of Vine Street and Maple Avenue, was dedicated on September 29 and had a seating capacity of 200 persons. This structure was a novelty in the wilderness of Kanabec County. 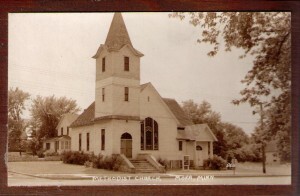 The church, under the leadership of Pastor G. C. Parker, quickly became the community center and the place for all social gatherings for youth, lecturers and prominent preachers of all denominations. A public school teacher, Miss Miars, ministered to the entire community by visiting the sick, conducting funerals and maintaining a Sunday school. That Sunday school, and morning and evening worship services were well attended by adults and young folks. They opened their doors so that other church groups could use the building for their own worship services as they grew too large to continue to meet in homes. Opening hearts, minds and doors once again the congregation responded to an urgent need for assistance when a horrendous wild fire devoured everything in its path near Hinckley on September 1, 1894. The Church building was utilized as a rest home and temporary hospital with handcars quickly bringing the survivors over the rails from Brook Park to Mora. Over four hundred persons lost their lives in that fire and over one hundred survivors were served at the church in the days that followed. Collections of blankets, food and clothing were gathered to aid the victims, meals were provided, medical aid was given and prayers and solace were freely given to all. The entire Mora community came together at the church to do what needed to be done. Another local service by this dedicated congregation in the 1940s and early 1950s was the food stand at the county fair which provided meals for fair visitors as well as a hearty meal for the concession people when they finished their work day at about 11:00 p.m.! The prices were nominal and the portions were beyond generous. Everyone pitched in, donated what they could from their farms and gardens and worked long hours to minister to this extended community. As the congregation grew and flourished, in 1955 they once again turned their attention to expanding their church structure and decided to build new on a tract of land between Highway #65 and Clark Street. The members were inspired to be working toward a new church and once again through a lot of personal involvement, construction began. The desire was for a simple, beautiful, functional and compact design and they opened the doors for their first worship service in their new building on Mother’s Day of 1956 with chairs and an organ borrowed from the Ogilvie congregation. The Mora United Methodist Church has not only changed its name through the years but its physical structure has also reflected the growth that has occurred and the changing needs of the congregation and the community. The church’s goal from the very beginning has always been service to the community in any way that contributed to the spiritual well-being of all. Open hearts, open minds, open doors – yesterday, today and tomorrow!